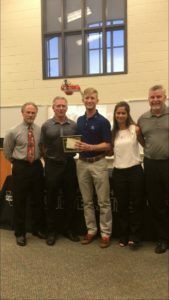 Congratulations Drew Ridings ($5,000), Adam Gracyalny, & Spencer Ball on their presentation of the Joe Dumphy Memorial Golf Scholarship. We started off our first year wonderfully by awarding incredible and hardworking students with the title of Joe’s character. Thank you all for your support & contribution to America’s youth & our son!